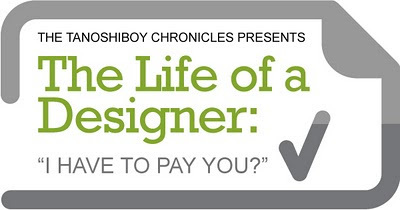 The Tanoshiboy Chronicles: Design & Illustration Blog: The Life of a Designer: "I Have To Pay You?" I'd like to share, every once in awhile, some of the daily events I go through when answering calls from clients. It'll be fun and a bit therapeutic for me. So please, supply some feedback on these tales and let me know if you'd like to read more. I received a call today from a woman who was looking for branding. She and her husband (both real estate professionals) have started a new home building company and needed a logo. I assured her she came to the right place. After giving me a list of everything she needed, I gave her a quote of $2100 for her branding package. She immediately said, "What? Did you say 100 or 2100?". I cleared it up for her and her once friendly tone completely changed. She stated, "Look, I'm all for paying people what they're worth. I understand that, but this is a little ridiculous. How long have you been doing this for? Me: 12 years, ma'am. I'm 32 years old in case you're wondering. Client: And did you go to school or something? Client: And you feel comfortable charging this amount of money to your clients? Me: I feel comfortable basing my prices on my skill and experience, yes. As a matter of fact, most of them understand that they're not paying for graphic design, but for my expertise on the subject of branding. Their logo is an identification of their business in its simplest form via the use of an icon and type and I work hard to design something effective, functional and attractive. Client: Well, you came highly recommended, but I think I'm going to take care of this myself. I think your prices are outrageous. Do you have a family? Me: I'm sorry to hear that, maam. And yes, I have a Wife. May I ask how you're going to take care of this yourself? Client: My husband has the Adobo programs on our computer, so I'm sure he and I can figure this out. I don't have the time to be shopping around for a designer. I need this done by next week and I'm not paying $2100 simply to press a few buttons. Me: Maam, what I do has nothing to do with software. It's just a tool I use. I suggest you find yourself a low quality designer. We deal in high quality work here and design each project with the utmost care, because in the end the product is a mini-commercial of our work. You should find yourself a designer who is willing to work with your budget if you want to be taken seriously in your industry. Client: No no no, I'll do this myself. I have the same tools here and can make one myself. Me: No problem. And by the way, are you hiring? Client: Hiring for what? Construction workers, home builders. I've always wanted to build a house from scratch. Client: My husband handles that side of the business. Do you have experience? Me: None whatsoever. I'd have no idea what I'm doing, but I have a whole garage full of tools I can bring with me. Client hangs up. I laugh.